One of my favorite things about summer is that it also happens to be cherry season. These small, deep red colored fruit are not only delicious as a snack but they are unbelievably packed with nutrition. The dark red color of the cherry isn’t just there for beauty – it is actually the result of high levels of anthocyanins. 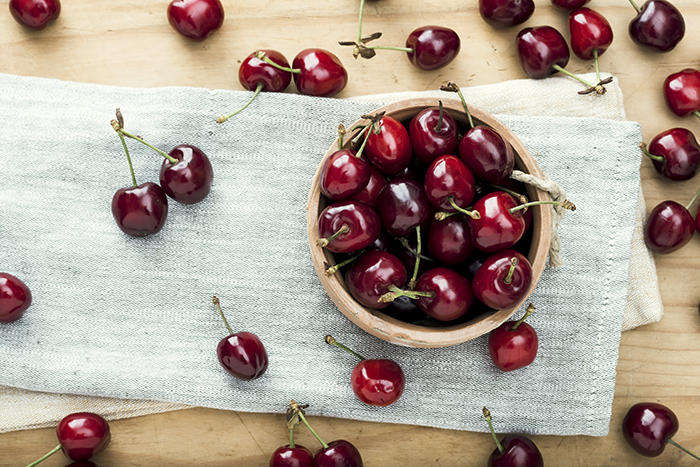 One of cherry’s claims to fame is its anti-inflammatory components, a property that’s due to the anthocyanins. But it doesn’t not stop there! Cherries are also highly antioxidant, they can help reduce post workout muscle pain, and lower the risk of gout. They are a wonderful source of potassium, making them a great choice for heart health. Having trouble sleeping? Cherries to the rescue! Studies have proven that cherries can be a great alternative to sleeping pills due to their naturally high melatonin content, a substance that helps people regulate sleep patterns. You can find fresh cherries at your local market in the summer and late spring. The rest of the year you will have to take a trip to the freezer section of the grocery store for your cherry fix. You can also find dried cherries in the bulk bins or packaged in the aisle. Just be sure that they do not add extra sugar, a common but unnecessary practice. I love fresh cherries as a snack with some nuts, but there are endless ways you can incorporate cherries into your meals. Off season, I will throw some cherries into a smoothie to give it some color and an extra punch. Dried cherries can go great in a trail mix all year round, and even as a topping on a salad. For the baking inclined, cherries make a wonderful addition to whole grain bread and muffin recipes.